Bettina Aptheker is a nationally recognized historian and a scholar of feminist studies. She received her Ph.D. in History of Consciousness from UC Santa Cruz and became the first ladder-rank faculty member of the Feminist Studies Department, then known as Women’s Studies, in 1987. 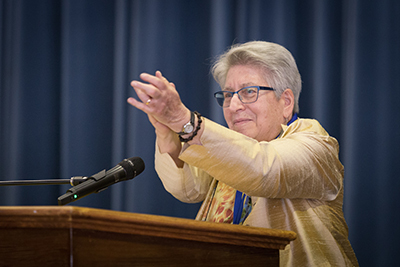 For nearly three decades Bettina has taught one of the country’s largest and most influential introductory feminist studies courses, exposing more than 10,000 students to her deeply compelling teaching. Bettina works extensively with graduate students in Feminist Studies, and other departments, and teaches graduate seminars, including Feminist Pedagogy and Black Feminist Reconstruction. She has received numerous awards over the years, and in June will be presented with the Dizikes Faculty Teaching Award in the Humanities.